Operating up to 20 times faster than competing products, durable tabletop printers. The 64-0x thermal transfer printer has a print speed of up to 400mm/sec, the best choice for increasing productivity. Thermal transfer printers will meet the toughest demands for industrial applications. 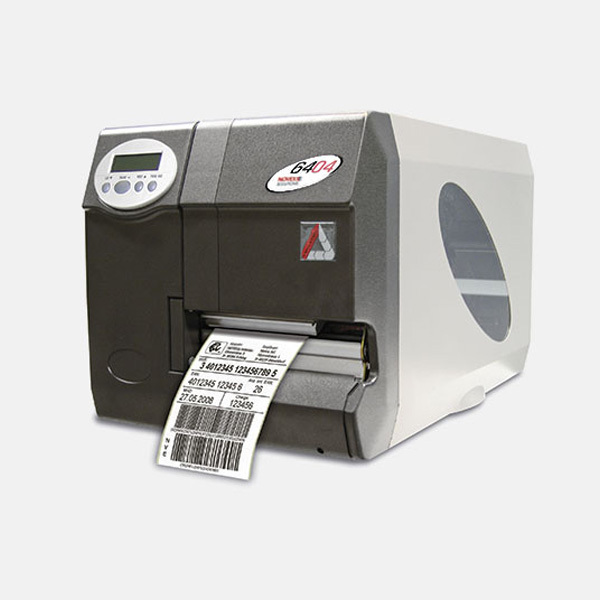 Whether used to print barcodes, tags, production labels, fonts and logos on any label material in excellent quality. This powerful machine is impressive thanks to several additional features that are critical when in constant industrial use. The 64-0x carries out any printing task in high resolution, with astonishing precision and intelligence. It protects against errors already in the input stage, uses no more ribbon than absolutely needed and features an extremely simple operating interface. In addition, this compact printing powerhouse is highly durable and robust, a product of the finest German craftsmanship. At the centre of the extensive range is the high performance processor, complemented with a font and bar code library. This allows for essential performance features such as enlargement capabilities, two-dimensional presentation and the ability to rotate the scalable fonts almost entirely freely. If even more performance is required, the standard 8 MB configuration can be upgraded to 32 MB. Fast: The lightning fast data transfers and the multi-tasking operating system allow considerable savings in time and enable the unit to print at up to 400 mm/s. Intelligent: The integrated dot-check system reports back on the status of each dot printed to maintain print quality and barcode readability. Practical: The Quick Change function makes it easy to change print heads – and the operation does not require any special tools. Economical: The automatic foil saving function uses all non-printed areas of 6 mm or larger, and guarantees that material is used most efficiently. Precise: The Near Edge printhead achieves a resolution of 300 dpi and ensures a consistently high-quality result at a print rate of 400 mm/s. Individualised: The modular concept includes removable accessories such as a knife, rewinder or dispenser, and supports all sorts of processing. Compatible: The 64-0x printers come standard with Avery Dennison EASY PLUG program language as well as ZPL emulation for easy upgrade and replacement. Rewinder: Functional – winds up printed label materials with the printed side facing inwards or outwards, makes the further handling easier. Dispenser: Reliable – with 1:1 print & apply system, handles different materials and formats. Additionally, an applicator is available, which puts the label automatically on your products.